Clarinet Concerto, Op. 68a (1975) [17�40]. Harp Concerto, Op. 50b (1970) [26�32]. Piano Concerto No. 3, Op. 40c (1968) [26�58]. aNew Philharmonia Orchestra, bcLondon Symphony Orchestra/David Atherton. Three top-flight soloists are the deciding factor in this disc�s success. Each of them gives 100% advocacy to Mathias�s music and the results make for eminently satisfying listening. 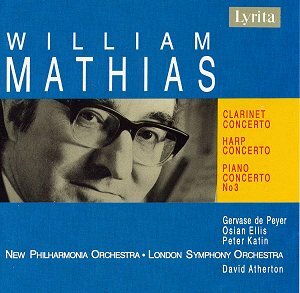 Mathias wrote these concertos explicitly for the soloists on this disc - there are also concertos in Mathias�s work-list for violin (György Pauk); organ (Gillian Weir); flute (William Bennett); oboe (Sarah Francis) and horn (Hugh Potts). At the time of his death, Mathias was planning concertos for cello and trumpet. The Clarinet Concerto was premiered by the BBC Welsh Symphony Orchestra under David Atherton (with Peyer as soloist) at St Asaph Cathedral in September 1975. The clarinet part in the first movement (Allegro vivo) is pithy and gestural, but always playful. Peyer is remarkably spirited in his response to the jazz-tinged rhythms and Atherton brings out the sparkling nature of the orchestration perfectly (the percussion includes glockenspiel, vibraphone and suspended cymbal for colour). If the Lento espressivo is in the final analysis a little less inspired (although colouristically it is very beautiful), the dancing finale provides all the joie de vivre one could wish. de Peyer is a remarkable player in the way he imbues the long lines of the slow movement with meaning and is also able to make the rhythms of the outer movements dance infectiously. The finale, incidentally, includes an appealing cadenza for clarinet and jazz cymbal just before the brief coda. Osian Ellis featured also on a disc of solo works by William Alwyn on Lyrita (Lyra Angelica on SRCD230: a MusicWeb recording of the Month, http://www.musicweb-international.com/classrev/2004/Mar04/Alwyn_Lyra.htm). Mathias chose to score for single wind and brass only in a (successful) attempt to lighten the textures in deference to his soloist. Ellis, the dedicatee, plays with the utmost delicacy and sensitivity. Interestingly, the work�s beginning could easily have come from the pen of Aaron Copland, before the music steps across the Atlantic in the twinkling of an eye and once more we are on home ground. This is Mathias in his most gentle mode spiced with some occasional more angular, almost (but not quite) Stravinskian, elements. The slow movement (marked �Adagio appassionato, sempre flessibile�) is prefaced by an quotation from a poem (�Welsh Landscape�) by R. S. Thomas evoking wild skies and spilled blood. Remarkably vivid images that Mathias brings to life in a dramatic ten-minute movement. The colouring of the harp sound by vibraphone is memorable in its beauty. The harp has traditionally been used to accompany dancing in Wales, and this connection is made real in the finale, a spring-fresh tonic to the clouds of the slow movement, played with great panache on this occasion by both soloist and orchestra (especially the wind soloists � only the bassoon appears slightly backward in the recorded balance). Despite the many attractions of the Clarinet Concerto and the Harp Concerto, it is the Third Piano Concerto that is the finest work on the disc. Written for the composer himself to perform, its influences include Bartók (the dancing rhythms of the first and last movements and the evocative Welsh Night-Music of the Second), Messiaen (orchestral colour), Stravinsky and (clearly at one point in the first movement) Gershwin. Peter Katin is the soloist on this recording, clearly a different pianist to the player I heard at the Wigmore Hall in July last year (http://www.musicweb-international.com/SandH/2003/July03/mozart167.htm). Here Katin has all the necessary equipment, including some glittering finger-work in the finale. Parts of the first movement include some pounding rhythms, here very exciting indeed. Perhaps because he was writing for himself (Mathias gave the first performance at the 1968 Swansea Festival), there is a confidence to the writing that is most impressive. One of the most impressive Lyrita offerings, this disc is the ideal starting point for any investigation into the music of William Mathias. The Piano Concerto in particular cannot fail to delight.